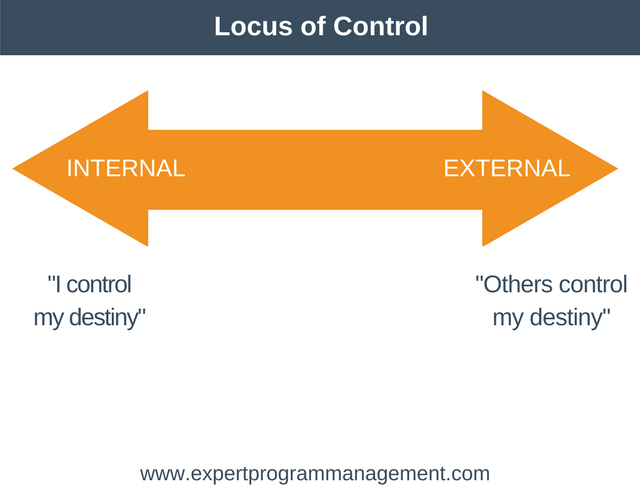 Locus of control relates to how much a person believes they have control over events in their life. A person with an internal locus of control believes they can influence events in their lives. A person with an external locus of control believes their life is controlled by external factors that they cannot influence. Those with an internal locus of control believe events in their life are the result of their actions. Those with an external locus of control blame external factors for events in their lives. As an example, consider students who fail an exam. A student with an internal locus of control might conclude that they didn’t work hard enough. A student with an external locus of control might conclude that their teacher has let them down. 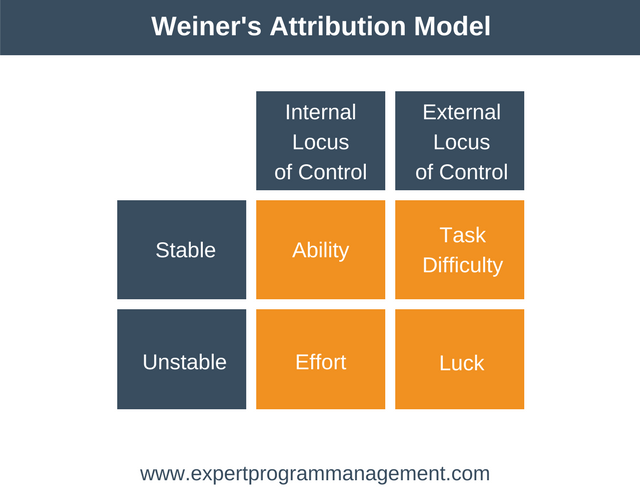 Julian Rotter developed the locus of control model in 1966. Rotter was an American psychologist. He developed the model whilst working at the University of Wisconsin. It surprised Rotter how much attention the model received. He claimed that it was like lighting a cigarette and starting a forest fire! In a very general sense, it is considered healthier to have an internal locus of control. However, there are advantages and disadvantages to each. Take responsibility for events that happen to them, both good and bad. Work hard to get what they want. Be less influenced by the opinions of others. Take action to improve their situation. Have a tendency to be direct and to the point. This can leave people feeling ‘trampled’. Can find it difficult to delegate, wanting to control everything. They can be good at “letting go” of stressful situations, and can thus be happier people. Tend to blame external factors for events that happen to them. Often feel powerless or hopeless. Play down their success, attaching it to luck. Give up faster when obstacles present themselves. Feel like they are a victim. Suppose you gave a presentation at work. Afterwards, your boss tells you it was a poor presentation, lacking in clarity. If you have an external locus of control you might blame the fact your brief was unclear. You might blame the fact that others weren’t forthcoming with the information you needed. You hope not to have the same problem again, provided these external factors don’t recur. If you have an internal locus you would take responsibility for your poor performance. Yes, your brief was poor. Yes, you didn’t get all the information you needed. But you take responsibility for this and resolve to do better next time. You might do this by clarifying your brief upfront, and by chasing people for information earlier. As you can see, the columns are our locus of control. The rows are our stability. Stability, as defined in the model, refers to how likely your reasons are to recur. Suppose you failed an exam because bad traffic made you late. This would be an unstable attribution, as the event that caused you to fail would change next time you failed the exam. Using this model, suppose a person with a high internal locus gave a great presentation. They would attribute it to their ability by saying something like, “I’m good at presentations”. They would expect the same success next time. Or they might attribute it to their effort by saying, “I worked hard”. This will give them encouragement to work hard next time. Suppose a person with a high external locus gave a great presentation. They might attribute it to the task difficulty by saying, “It was easy”. If they gave a poor presentation they might alternatively attribute it to the difficulty of the task. To find out whether you have an internal or external locus of control you can take a quiz here. If you don’t like your results, then it’s sort of funny that the model predicts that you’ll blame others! People with an internal locus believe they are in control of their destiny. Because of this they set goals and work hard to achieve them. They get creative or work harder when obstacles arise. Is it any wonder they are more successful in the workplace? People with an external locus of control believe events happen to them. They don’t set goals because they believe what will be will be. This is also the reason they give up when challenges and obstacles arise. If there is a key to developing an internal locus of control it’s this. Understand that both types are self-fulfilling. If you think your fate is in the hands of others you act to confirm that belief. If you think that your fate is under your control you will act to confirm that belief. Thus, each of the tips below has a point. Namely, to get you to begin the slow process of realizing that you do have some control over your fate. The good news is that even small progress can have a big benefit once the self-fulfilling aspects start to kick in. Learn how to set goals for yourself. Start small. Identify one or two things you can achieve in the next few weeks. You can learn more about goal setting here. By developing your problem-solving skills you’ll become more confident. Instead of saying, “why me?” when problems arise you’ll be able to coolly analyze the alternatives and select the right option for you. The following two articles can help with your decision making. The Eisenhower Matrix is great for prioritizing your to-do list. A Weighted Decision Matrix is a useful tool when you can’t decide between a range of options. Watch out for when you hear yourself saying things to yourself like, “I can’t do it!” or “There’s no point!”. If you don’t catch these thoughts then very soon you’ll start to believe what you’re saying to yourself. Take a step back and remind yourself that you do have some choice, and you can make some difference. Whether you think you can, or you think you can’t. You’re right. To learn more about catching self-talk and choosing empowering beliefs, read this article. Locus of control refers to the extent to which someone believes their fate is the result of their actions. Someone with an internal locus believes their fate is the result of their actions. Whereas someone with an external locus believes external events determine their fate.